African Botanics has done it again. For weeks African Botanics had posted sneak peeks on their Instagram about their newest creation, the Infusion Florale Concentré Micro-Liquid Serum, and let me tell you, it was well worth the wait. Infusion is a luxurious essence in the form of a silky, liquid-light serum. This brilliant “skin transformer / micro-serum hybrid” packs a punch! The Serum contains highly concentrated active phytonutrients, trace elements, humectants, antioxidants, and advanced molecular biochemistry to deliver a boost of hydration and to revitalize the appearance of the skin. An age-defying regenerating matrix of Immortelle oligosaccharides, Micro-Algae, Seaweed, anti-pollution Oceanic Cell Shields, moisture-binding plant Peptide complex, and Marine glucans to improve texture, deeply revitalize skin, and form a dynamic skin barrier. Kalahari Desert Salt, hand-harvested African desert and bush plants, Vitamin C Ester, CoQ10, Willow Bark, and Lactic Acid nourish and tone while also bringing clarity and luminosity to the skin. White Lupine provides low molecular-weight glutaminated oligo peptides to help boost epidermal lipid synthesis and to reinforce the barrier function while infusing skin with hydration. I’ve been using Infusion for the past two weeks now and I’m in love! Infusion has a watery texture and smells just like their Résurrection Cell Recovery Serum. I’m so used to using a mist or toner after cleansing, but I’ve been using Infusion right after cleansing as it is intensely hydrating. In both my daytime and nighttime routine, I pour a few drops of Infusion into the palm of my hand, press my hands together to evenly distribute the essence, and then gently pat it into my face. Most of the time, I don’t feel the need to apply another serum after (only if I’m feeling extra, lol), since the Infusion is full of actives. I then apply a face oil like the Fleurs d’Afrique Intensive Recovery Oil, and then sometimes a face cream like the Fleurs d’Afrique Intensive Recovery Cream — because, why not? After application, my skin drinks it in immediately, and feels super-plump and supple. It literally feels like the Serum creates a weightless veil over my skin to lock in moisture, and to lift and firm the skin. After using Infusion for a couple weeks now, my skin barrier does appear a lot stronger. 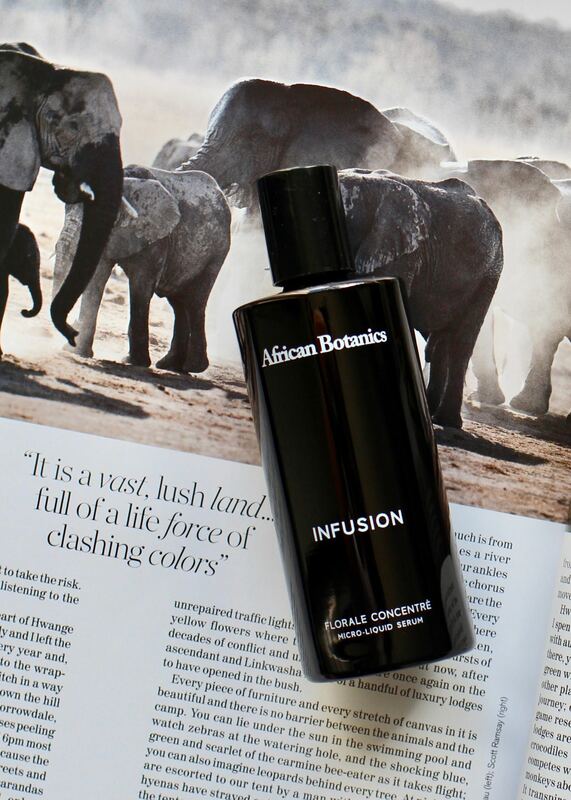 Infusion (100ml) retails for $200 USD and can be purchased directly from African Botanics. Infusion was kindly provided for consideration, however all opinions expressed are my own. This post contains no affiliate links or codes. How would you compare this to the rose essence, nutritive molecule serum and cloudburst? Are they similar/interchangeable? Or would you suggest one more than others? So curious how infusion fits in!